In his first trip to the United States since 1959, Cuban President Raul Castro met U.S. President Barack Obama, former President Bill Clinton, New York Governor Andrew Cuomo, Mayor Bill De Blasio, Russian leader Vladimir Putin, and other dignitaries. 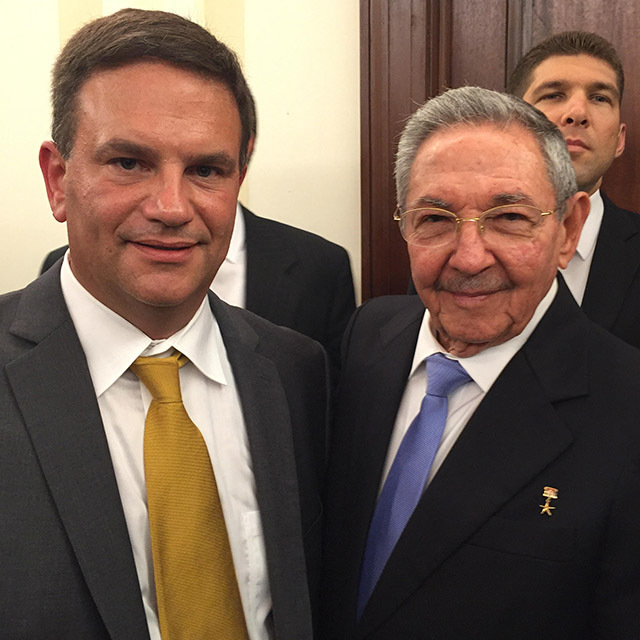 Now, he can add insightCuba’s President, Tom Popper, to the list. Earlier, Castro addressed the U. N. general assembly (an annual gathering of world leaders), calling for an end to U.S. sanctions against the island nation. The relationship between the two countries chilled in the early 1960s during the Cuban Missile Crisis, but in recent years, has thawed dramatically. Easier travel between Cuba and the U.S., and infrastructure improvements on the island, are in the works, and both countries have reestablished embassies on each other’s soil. For decades, Americans wanting to visit Cuba have endured restrictions and bureaucracy. With President Obama’s December, 2014 announcement about easing limitations, interest in our near neighbor has increased considerably. Castro’s trip to New York comes just after Pope Francis’s visit to Cuba and the U.S., making September 2015 a remarkable time in world history.